NEMCO Motorsports’ NASCAR Camping World Truck Series History at the Dover International Speedway ... This weekend will mark NEMCO Motorsports’ fourth NASCAR Camping World Truck Series start at the 1-mile concrete oval track. The organization earned a team best finish of sixth-place at the Dover, Del.,-facility with John Hunter Nemechek on May 30, 2014. Three starts at the Dover International Speedway have earned NEMCO Motorsports an average starting position of 10.7 and an average finish of 14.3. NEMCO Motorsports’ NASCAR Camping World Truck Series History ... Since entering the NASCAR Camping World Truck Series in 1995, the Mooresville, N.C.,-based organization has logged 101 starts from five drivers, resulting in strong performances that include four victories (Watkins Glen, Chicago, Atlanta and Canada) and 22 top-five finishes, as well as 49 top-10 finishes with an average starting position of 14.0 and an average finishing position of 12.6. Collective NEMCO Motorsports … In the season's first five events, NEMCO Motorsports' two NASCAR Camping World Truck Series entries have posted three top-five and three top-10 finishes. The NEMCO Motorsports-prepared Chevrolet Silverados have completed 1,182 total laps. John Hunter Nemechek and Joe Nemechek rank 11th and 17th respectively in the NASCAR Camping World Truck Series driver points. All in the Family … Team owner Joe Nemechek has one win (2003), four top-five and eight top-10 finishes in the NASCAR XFINITY Series in 27 starts at the Dover International Speedway. In 39 Monster Energy NASCAR Cup Series starts at the “Monster Mile,” Nemechek has one top-five and five top-10 finishes. Meet John Hunter Nemechek … John Hunter Nemechek is scheduled to participate in an autograph session with the NASCAR Camping World Truck Series from 12:30 p.m. to 1:15 p.m. (ET) on Friday, June 2. The session will be located in the Delaware Office of Highway Safety display in the Dover International Speedway Midway Fan Zone. Follow NEMCO Motorsports on Social Media ... To keep up-to-date with the latest news, information and exclusive content, visit NEMCO Motorsports’ Twitter page - @NEMCOMotorsport. Also, follow the NEMCO Motorsports drivers on their personal Twitter pages - @FrontRowJoe87 and @JHNemechek. You can also “like” Joe Nemechek on his official Facebook page at /NASCARJoe, and John Hunter Nemechek on his official Facebook page at /JohnHunterNemechek. Catch the Action ... The Bar Harbor 200 presented by Sea Watch International will be broadcast live on FS1 on Friday, June 2 starting with the pre-race show at 5:00 p.m. (ET). It will also broadcast live at 5:00 p.m. (ET) on the Motor Racing Network (MRN) and SiriusXM NASCAR Radio. Qualifying for the sixth event of the 2017 NASCAR Camping World Truck Series schedule will air on Friday at 2:30 p.m. (ET) on FS1. The Bar Harbor 200 presented by Sea Watch International at the Dover International Speedway will re-air on Saturday, June 3 at 2:30 a.m. (ET) on FS1. This Week's NEMCO Motorsports Chevrolet Silverado at the Dover International Speedway ... John Hunter Nemechek will pilot Chassis No. 039 in the Bar Harbor 200 presented by Sea Watch International at the Dover International Speedway. The Gere Kennon-led team last unloaded this NEMCO Motorsports prepared chassis at the Atlanta (Ga.) Motor Speedway on March 4 where Joe Nemechek finished in the 24th-position after starting in the 22nd-position in the chassis’ first appearance of the 2017 NASCAR Camping World Truck Series season. Since 2014, Chassis No. 039 has an average finishing position of 10.6 in five starts at the Texas Motor Speedway, Atlanta Motor Speedway, and the Michigan International Speedway. Only Joe Nemechek has been behind the wheel of chassis No. 39. Sound the Alarm … The NEMCO Motorsports No. 8 Chevrolet Silverado returns with the Fire Alarm Services, Inc., (FAS) brand as the primary sponsor at the Dover International Speedway. As part of the 2017 partnership agreement, the NEMCO Motorsports No. 8 Chevrolet Silverado will carry the Fire Alarm Services, Inc., brand as the primary sponsor for seven NASCAR Camping World Truck Series events. Headquartered in Arvada, Colorado, Fire Alarm Services, Inc., provides superior fire and life safety and security services and products for protecting their client's real estate investment. Autism: Understanding the Puzzle … To help generate awareness for Autism, John Hunter Nemechek will be showing his support for Autism Delaware’s mission throughout the race weekend at the Dover International Speedway by displaying a puzzle piece decal on his No. 8 Fire Alarm Services, Inc. / ACME Chevrolet Silverado. Speedway Stats: In 30 combined NASCAR Camping World Truck Series starts on speedways (tracks 1 to 2-miles in length), John Hunter Nemechek has recorded two victories (Chicago and Atlanta), 10 top-five and 16 top-10 finishes. He has led for a total of 89 laps on NASCAR’s speedway tracks. Race Rewind: Dover International Speedway … John Hunter Nemechek felt like his No. 8 Cricket SX3 Chevrolet Silverado would be one of the trucks to beat in the Jacob Companies 200 NASCAR Camping World Truck Series race at the Dover International Speedway last year, but ultimately an ill-handling machine hampered his efforts on the racetrack. When the checkered flag dropped, Nemechek was in 15th-place. In the Rearview Mirror: Charlotte Motor Speedway ... John Hunter Nemechek, driver of the No. 8 Chevrolet Silverado for NEMCO Motorsports, finished 22nd in the North Carolina Education Lottery 200 NASCAR Camping World Truck Series race on May 19 at the Charlotte Motor Speedway in Concord, N.C. After starting in the 13th-position in the 32-truck field, Nemechek finished the first 40 lap segment in the third position. On Lap 79, before the conclusion of Stage 2, a right-front tire failure resulted in numerous visits to pit road to repair damage. Despite the handling issues and falling to 28th-place, Nemechek made valiant attempts to position the Chevrolet Silverado to gain track position while two-laps down. Nemechek was able to cross the finish line in 22nd-place. Season-to-date … Through the first five NASCAR Camping World Truck Series races of the 2017 season, John Hunter Nemechek has completed 704 of 781 laps contested (90.1 percent), has led zero laps and is currently 11th in the driver point standings, and 13th in the NASCAR Camping World Truck Series owner points. In addition, the NEMCO Motorsports driver has collected two top-five and two top-10 finishes, has spent 480 laps running in the top 15 and has made 212 green-flag passes thus far this season. NEMCO Motorsports’ NASCAR Camping World Truck Series History at the Charlotte Motor Speedway ... This weekend will mark NEMCO Motorsports’ fourth NASCAR Camping World Truck Series start at the 1.5-mile quad-oval track. The organization earned a team best finish of 11th-place at the Concord, N.C.,-facility twice with Joe Nemechek on May 16, 2014, and on May 15, 2015. Three starts at the Charlotte Motor Speedway have earned NEMCO Motorsports an average starting position of 17.7 and an average finish of 11.3 with a total of four laps led. NEMCO Motorsports’ NASCAR Camping World Truck Series History ... Since entering the NASCAR Camping World Truck Series in 1995, the Mooresville, N.C.,-based organization has logged 100 starts from five drivers, resulting in strong performances that include four victories (Watkins Glen, Chicago, Atlanta and Canada) and 22 top-five finishes, as well as 49 top-10 finishes with an average starting position of 14.0 and an average finishing position of 12.5. Collective NEMCO Motorsports … In the season's first four events, NEMCO Motorsports' two NASCAR Camping World Truck Series entries have posted three top-five and three top-10 finishes. The NEMCO Motorsports-prepared Chevrolet Silverados have also completed 1,050 total laps. John Hunter Nemechek and Joe Nemechek rank 11th and 16th respectively in the NASCAR Camping World Truck Series driver points. All in the Family … Team owner Joe Nemechek has one win (1997), four top-five and eight top-10 finishes in the NASCAR XFINITY Series in 35 starts at the Charlotte Motor Speedway, and also claimed the pole position in 1997. In addition, Nemechek has 36 Monster Energy NASCAR Cup Series starts at the Charlotte Motor Speedway including two top-five finishes, as well as five top-10 finishes. Meet John Hunter Nemechek … Fans can visit the Team Chevy Racing display located in the fan midway at the Charlotte Motor Speedway for a question and answer session with John Hunter Nemechek on Friday, May 19 at 2:45 p.m. (ET). Nemechek is scheduled to participate in an autograph session with the NASCAR Camping World Truck Series from 3:00 p.m. to 3:45 p.m. (ET), located in the Whiskey River Hospitality area under the Ford grandstands, on Friday. Media Availability ... John Hunter Nemechek will be accessible to media in attendance at the Charlotte Motor Speedway on Thursday, May 18 at 4:00 p.m. (ET). The media availability will be hosted inside the media center. Catch the Action ... The North Carolina Education Lottery 200 will be broadcast live on FS1 on Friday, May 19 starting with the pre-race show at 8:00 p.m. (ET). It will also broadcast live at 8:00 p.m. (ET) on the Motor Racing Network (MRN) and SiriusXM NASCAR Radio. Qualifying for the fifth event of the 2017 NASCAR Camping World Truck Series schedule will air on Friday at 4:30 p.m. (ET) on FS1. The North Carolina Education Lottery 200 at the Charlotte Motor Speedway will re-air on Saturday, May 20 at 1:00 p.m. (ET) on FS1. This Week's NEMCO Motorsports Chevrolet Silverado at the Charlotte Motor Speedway ... John Hunter Nemechek will pilot Chassis No. 037 in the North Carolina Education Lottery 200 at the Charlotte Motor Speedway. The Gere Kennon-led team last unloaded this NEMCO Motorsports prepared chassis at the Las Vegas (Nev.) Motor Speedway on October 1, 2016 where Nemechek finished in the 16th-position after starting in the 15th-position in the chassis’ second appearance of the 2016 NASCAR Camping World Truck Series season. Since 2015, Chassis No. 037 has an average finishing position of 8.4 in five starts, with one previous start at the Charlotte Motor Speedway finishing 11th with Joe Nemechek. Testing, testing, 1, 2, 3 … Perhaps the fresh memory from the recent NASCAR Camping World Truck Series open test session at the Charlotte Motor Speedway on May 2 will pay-off for John Hunter Nemechek. Among the 20 drivers participating in the test session, Nemechek put the No. 8 Chevrolet Silverado through its paces under the watchful eye of crew chief Gere Kennon, turning a lap of 30.565 seconds at 176.673 mph. Hometown Advantage ... This weekend marks John Hunter Nemechek’s second Charlotte Motor Speedway appearance with the NASCAR Camping World Truck Series. The Mooresville, N.C., driver has earned an average starting position of 21.0 and an average finishing position of 12.0 at the Concord, N.C.,-facility. Speedway Stats: In 29 combined NASCAR Camping World Truck Series starts on speedways (tracks 1 to 2-miles in length), John Hunter Nemechek has recorded two victories (Chicago and Atlanta), 10 top-five and 16 top-10 finishes. He has led for a total of 89 laps on NASCAR’s speedway tracks. Race Rewind: Charlotte Motor Speedway … John Hunter Nemechek, driver of the No. 8 Chevrolet Silverado for NEMCO Motorsports, finished in the 12th-postion in last year’s rain-delayed North Carolina Education Lottery 200 NASCAR Camping World Truck Series race at the Charlotte Motor Speedway on May 21, 2016. By Lap 30 Nemechek was scored in sixth-place after starting in the 21st-postion. However, varying fuel strategies hindered Nemechek from contending for the win in the closing laps of the 201-mile event. In the Rearview Mirror: Kansas Speedway ... John Hunter Nemechek, driver of the No. 8 Fire Alarm Services, Inc., Chevrolet Silverado for NEMCO Motorsports, finished third in the Toyota Tundra 250 NASCAR Camping World Truck Series race on May 12 at the Kansas Speedway in Kansas City. 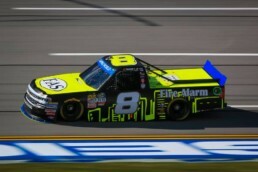 After starting in the 14th-place in the 32-truck field, Nemechek finished the first 40 lap segment in the fourth position, and was in the seventh-place ending the Stage 2 on Lap 80. After restarting in the fourth-place on Lap 138, Nemechek was able to move to third battling with the leaders. 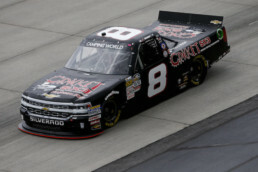 Nemechek scored his best finish of the season, and secured his second top-five in four NASCAR Camping World Truck Series races. Season-to-date … Through the first four NASCAR Camping World Truck Series races of the 2017 season, John Hunter Nemechek has completed 572 of 647 laps contested (88.4 percent), has led 0 laps and is currently 11th in the driver point standings, and 14th in the NASCAR Camping World Truck Series Owner points. In addition, the NEMCO Motorsports driver has collected two top-five and two top-10 finishes, has spent 406 laps running in the top 15 and has made 179 green-flag passes thus far this season. NEMCO Motorsports’ NASCAR Camping World Truck Series History at the Kansas Speedway ... This weekend will mark NEMCO Motorsports’ fourth NASCAR Camping World Truck Series start at the 1.5-mile tri-oval track. The organization earned a team best finish of second-place with Ryan Newman on May 8, 2015. Three starts at the Kansas Speedway have earned NEMCO Motorsports an average starting position of 8.7 and an average finish of 13.0. NEMCO Motorsports’ NASCAR Camping World Truck Series History ... Since entering the NASCAR Camping World Truck Series in 1995, the Mooresville, N.C.,-based organization has logged 99 starts from five drivers, resulting in strong performances that include four victories (Watkins Glen, Chicago, Atlanta and Canada) and 21 top-five finishes, as well as 48 top-10 finishes with an average starting position of 14.0 and an average finishing position of 12.6. This weekend at the Kansas Speedway will mark the 100th NASCAR Camping World Truck Series start for NEMCO Motorsports. Collective NEMCO Motorsports … In the season's first three events, NEMCO Motorsports' two NASCAR Camping World Truck Series entries have posted two top-five and two top-10 finishes. The NEMCO Motorsports-prepared Chevrolet Silverados have also completed 883 total laps. Joe Nemechek and John Hunter Nemechek rank 12th and 15th respectively in the NASCAR Camping World Truck Series driver points. Family Matters … John Hunter Nemechek has been to Victory Lane at the Kansas Speedway before – celebrating with father Joe Nemechek when he was seven-years old. Team owner Joe Nemechek has one win (2004), two top-five and two top-10 finishes in the Monster Energy NASCAR Cup Series in 15 starts at the Kansas Speedway. In 2004, Nemechek not only captured his fourth career Monster Energy NASCAR Cup Series win, but also took the pole for the 400-mile, 267-lap event, and additionally won the supporting NASCAR XFINITY Series race in his NEMCO Motorsports entry. Meet John Hunter Nemechek … Fans can visit the Team Chevy Racing display located in the fan midway at the Kansas Speedway for a question and answer session with John Hunter Nemechek on Friday, May 12 at 12:30 p.m. (CT). Nemechek is scheduled to participate in an autograph session with the NASCAR Camping World Truck Series from 2:00 p.m. to 2:45 p.m. (CT), located in the Kansas Speedway Infield Fan Zone, on Friday. Additionally, Nemechek will participate in a question and answer session at The Finish Line, located in hospitality village (Turn 1 of the grandstands) on Friday at 2:45 p.m. (CT). Catch the Action ... The Toyota Tundra 250 will be broadcast live on FS1 on Friday, May 12 starting with the pre-race show at8:00 p.m. (ET). It will also broadcast live at 8:00 p.m. (ET) on the Motor Racing Network (MRN) and SiriusXM NASCAR Radio. Qualifying for the fourth event of the 2017 NASCAR Camping World Truck Series schedule will air on Friday at 4:30 p.m. (ET) on FS1. The Toyota Tundra 250 at the Kansas Speedway will re-air on Tuesday, May 16 at 7:30 a.m. (ET) on FS1. This Week's NEMCO Motorsports Chevrolet Silverado at the Kansas Speedway ... John Hunter Nemechek will pilot Chassis No. 040 in the Toyota Tundra 250 at the Kansas Speedway. The Gere Kennon-led team last unloaded this NEMCO Motorsports prepared chassis at the Chicagoland Speedway on September 16, 2016, where Nemechek finished in the 14th-position after starting in the 18th-position in the chassis’ second appearance of the 2016 NASCAR Camping World Truck Series season. Since 2015, Chassis No. 040 has an average finishing position of 10.5 in eight starts, with one previous start at the Kansas Speedway finishing 28th with Nemechek. Sound the Alarm … The NEMCO Motorsports No. 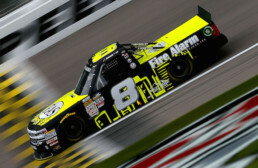 8 Chevrolet Silverado returns with the Fire Alarm Services, Inc., (FAS) brand as the primary sponsor at the Kansas Speedway for the second consecutive NASCAR Camping World Truck Series season with driver John Hunter Nemechek. As part of the 2017 partnership agreement, the NEMCO Motorsports No. 8 Chevrolet Silverado will carry the Fire Alarm Services, Inc., brand as the primary sponsor for seven NASCAR Camping World Truck Series events. Headquartered in Arvada, Colorado, Fire Alarm Services, Inc., provides superior fire and life safety and security services and products for protecting their client's real estate investment. In the season debut for Fire Alarm Services, Inc., Nemechek finished in the fourth-position at the Daytona (Fla) International Speedway on February 24. Yellow Brick Road to the Kansas Speedway ... This weekend marks John Hunter Nemechek’s second Kansas Speedway appearance with the NASCAR Camping World Truck Series. The Mooresville, N.C., driver has earned an average starting position of 6.0 and an average finishing position of 28.0 at the Kansas City, Kan.,-facility. Speedway Stats: In 28 combined NASCAR Camping World Truck Series starts on speedways (tracks 1 to 2-miles in length), John Hunter Nemechek has recorded two victories (Chicago and Atlanta), nine top-five and 15 top-10 finishes. He has led for a total of 89 laps on NASCAR’s speedway tracks. Race Rewind: Kansas Speedway … John Hunter Nemechek, driver of the No. 8 Andy's Frozen Custard Chevrolet Silverado for NEMCO Motorsports, finished 28th in the NASCAR Camping World Truck Series race last year at the Kansas Speedway. After rising to second from his sixth-place starting spot, Nemechek was on his way toward securing a solid finish in the extended 170-lap race around the 1.5-mile oval, but an early-race accident on Lap 48 caused damage to the No. 8 Chevrolet Silverado, and the night ended in dejection with two bouts of on-track trouble—including a blown tire. In the Rearview Mirror: Martinsville (Va.) Speedway ... Due to a parts failure at the Martinsville Speedway, John Hunter Nemechek, the driver of the No. 8 D.A.B. Constructors, Inc., Chevrolet Silverado, finished in the 28th-place in the NASCAR Camping World Truck Series Alpha Energy Solutions 250 on April 1. Starting strong from the 12th-place in the 32-truck field, Nemechek finished the first 70 lap segment in the tenth position. He continued to show strength, climbing all the way to fourth when an ignition wire failure resulted in a caution. The misfortune occurred on Lap 119, forcing Nemechek to the garage to evaluate the issue, Crew chief Gere Kennon was able to locate the faulty part and Nemechek returned to track. On Lap 140 Nemechek returned to pit road, and persevered to be the fastest truck on track while 23 laps down. Season-to-date … Through the first three NASCAR Camping World Truck Series races of the 2017 season, John Hunter Nemechek has completed 405 of 480 laps contested (84.4 percent), has led 0 laps and is currently 15th in the driver point standings, 21st in the NASCAR Camping World Truck Series owner points. In addition, the NEMCO Motorsports driver has collected one top-five and one top-10 finish, has spent 240 laps running in the top 15 and has made 137 green-flag passes thus far this season.